Kokanee Glacier Provincial Park is located on the Powder Highway in the Selkirk Mountains in the West Kootenays region of British Columbia. It was established in 1922 and is one of the oldest provincial parks in B.C. With an area of 320 square kilometres this park has unlimited hiking and mountaineering in summer and ski touring in winter. The former training grounds for the Canadian National Ski Team was Kokanee Glacier and also where the park gets it's name sake from. This glacier offers year round ski touring if you have the legs for the twenty kilometre round trip hike in and out. 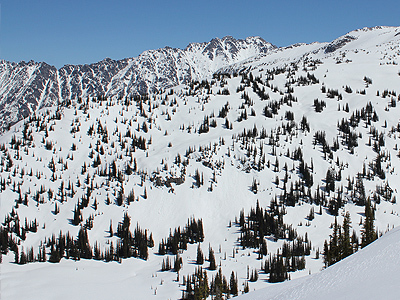 If not then Kokanee Glacier Cabin offers budget overnight accommodation in a first class backcountry lodge setting. The Alpine Club of Canada manages bookings and reservations for the cabin. In summer the cabin fills up quickly so reserve your spots early. In winter you need to enter a lottery in order to win a spot at the cabin which costs approximately $800 since access is via helicopter only. Have a read below and let us know if we missed any routes and if you get a chance to ski any of them then post some info in our forums. We want to hear about your adventures in Kokanee Glacier Park so don’t forget to post a trip report in the backcountryskiingcanada.com forums. If you have a new route in the area you want to share, mouse-on over here. N-Joy. For a full listing of backcountry huts, cabins and lodges check out the Coast Mountain cabins/huts/lodges page over here. 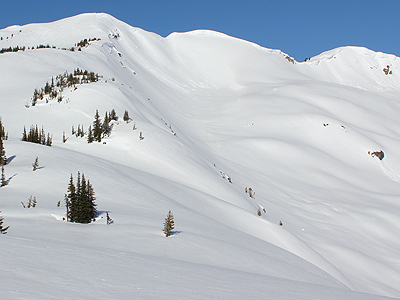 Tanal Peak is located directly North of Kokanee Glacier Cabin and provides good steep West face skiing on a long sustained pitch that is fairly close to the cabin and easy to access. Over Easy is a quick, short lap close to Kokanee Glacier Cabin that is accessed just North of the heli-pad behind Kokanee Glacier Cabin. Gain Happy Valley Ridge and skin across this small Valley towards the West end where you will see the saddle at the South end of Tanal Peak. If conditions permit and you feel comfortable ski down and find a safe place in the trees to switch as you are exposed to slides from the slope you just skied. To return to Kokanee Glacier Cabin skin Southeast up to Enterprise Pass and then descend to the Kokanee Glacier Cabin. Hot Cheeks starts 1/3 the way up the South ridge of Tanal Peak. Beginning at Kokanee Glacier Cabin head North of the heli-pad gaining Happy Valley Ridge. Skin across Happy Valley and gain the South ridge of Tanal Peak as low as possible as Hot Cheeks is just above the North side of the saddle at the West end of Happy Valley. If conditions permit and you feel comfortable ski down and find a safe place in the trees to switch as you are exposed to slides from the slope you just skied. To return to Kokanee Glacier Cabin skin Southeast up to Enterprise Pass and then descend to the Kokanee Glacier Cabin. The route Holy Slab starts 1/3 the way up the South ridge and just pass Hot Cheeks on the South ridge of Tanal Peak. Starting at Kokanee Glacier Cabin head North of the heli-pad gaining Happy Valley Ridge. Skin across Happy Valley and gain the South ridge of Tanal Peak as low as possible. Climb to 2100 metres (approximately one third the way up the ridge) avoiding any cornices that may form along the ridge. Ski down the West face of Tanal Peak but be sure conditions are safe first as this face slides frequently as it is steep and sustained. Stopping at valley bottom you will be at the South end of Tanal Lake. Be sure to switch over somewhere safe as you are exposed to slides from the slope you just skied. To return to Kokanee Glacier Cabin skin Southeast up to Enterprise Pass and then descend to the Kokanee Glacier Cabin. Big Meatballs starts at the summit of Tanal Peak and requires a sustained 340 metre climb starting at Kokanee Glacier Cabin. The easiest way to the summit is via Happy Valley Ridge which lies directly North of the cabin. Head North past the heli-pad and gaining Happy Valley Ridge and then skin across Happy Valley and gain the South ridge of Tanal Peak as low as possible. Climb this to the summit avoiding any cornices that may form. From the summit ski down the West face of Tanal Peak but be sure conditions are safe first as this face slides frequently as it is steep and sustained. Stopping at valley bottom at Tanal Lake be sure to switch over somewhere safe as you are exposed to slides from both sides of the valley. To return to Kokanee Glacier Cabin you need only to skin Southeast up to Enterprise Pass and then descend to the cabin. Future Champions is found on the far North end of the West side of Tanal Peak and in order to avoid climbing up and over Tanal Peak and the exposure that this presents, the best way to reach this route is to descend Enterprise pass and climb the West ridge of Tanal Peak which is less steep and open. 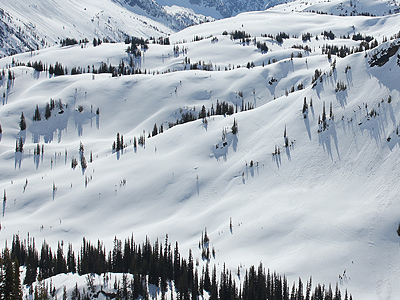 Enterprise Pass is a short 60 metre climb directly north of the Kokanee Glacier Cabin heli pad. Ski down into the valley and cross Tanal Lake being sure to avoid avalanche exposure from both sides. From the lake contour north and then East to gain the West ridge of Tanal Peak. 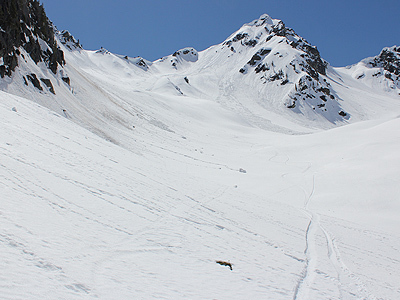 Climb until you reach 2100 metres then switch over to ski mode and ski directly down to Tanal Lake staying in the relative safety of the trees. From valley bottom skin back up to Enterprise Pass (to the Southeast) and back to the cabin the exact same way you came. Cream Puff is also found on the far North end of the West side of Tanal Peak so again in order to avoid climbing up and over Tanal Peak follow the same up track as you would for Future Champion above. Descend Enterprise pass and climb the West ridge of Tanal Peak which is less steep and open than Tanal Peak. 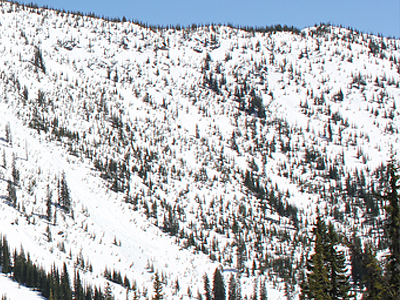 Enterprise Pass is a short 60 metre climb directly north of the Kokanee Glacier Cabin heli pad. Ski down into the valley and cross Tanal Lake being sure to avoid avalanche exposure from both sides. From the lake contour north and then East to gain the West ridge of Tanal Peak. Climb until you reach 2100 metres then switch over to ski mode and ski down in a Northwesterly direction into the trees for approximately 140 metres of gentle turns. Once the terrain mellows out you will need to skin West to then wrap back around to the South and again reach Tanal Lake. From here skin back up to Enterprise Pass and back to the cabin the exact same way you came in. 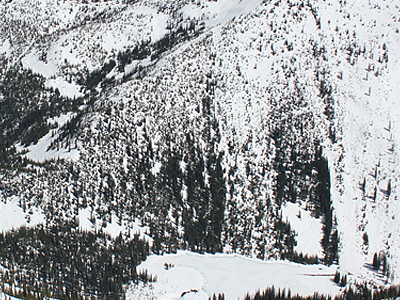 Mount Robert Smith is located Northwest of Kokanee glacier Cabin and accessed via Enterprise Pass and the Enchanted Forest. This is a longer walk and thus a good location to spend the day. The skin back can be relatively long so be sure you are prepared for the day and for weather and conditions to change. Mount Robert Smith is a fun objective from Kokanee Glacier Cabin which provides a pretty straight forward 340 metre descent. Access is either via skiing Unibomber, Lute Fish, Aquavit or Roll Map as mentioned below or the more common and faster route of skinning through Enterprise Pass. Here we will describe the Enterprise Pass route. From Kokanee glacier Cabin head Northwest to the obvious pass behind the cabin and heli-pad. It's a short 60 metre climb to gain the pass and once through you will begin to descend to the what's know as "The Enchanted Forest". Descend only about 20 meters and then start contouring dead west so that you do not loose too much elevation that you will ultimately have to skin back up. Heading West you will enter the trees of the Enchanted Forest and after approximately one kilometre you will emerge in an open value with the routes Unibomber, Lute Fish, Aquavit and Roll Map on your left and the big beautiful Southeast face of Mt. Robert Smith on your right. There are plenty or routes up the face so pick the safest line and be sure to use the few islands of safety. The typical route is to gain the saddle between Mount Robert Smith and the unknown peak to the East. From the saddle the summit is only a short distance away. Be sure avi conditions permit this ascent/descent as do your skills and judgement. Once on the summit the ski down offers plenty of room for everyone and lots of variations. From the valley floor use your up track again or retrace your skin track back to Kokanee glacier Cabin. Mark's Slot can be found on the North Face of Mt. Robert Smith so follow the directions for that route in order to gain the saddle below and to the East of the summit. Once at the saddle the descent is pretty obvious, you ski down the North face descending to valley bottom. 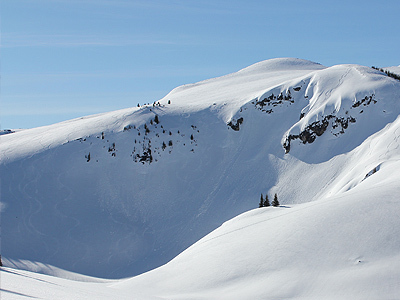 Be aware of cornices on the ridge as they are common as is wind loading just over the ridge as you drop in. There are plenty of lines on this North aspect so you can skin back to the top to try other options or head East from the valley floor trending Southeast to arrive at Tanal Lake and Enterprise Pass. There is huge exposure from both sides once at Tanal Lake and from the West face of Tanal Peak so be sure to stay well away from this face and in the trees. From Tanal Lake the ascent is a moderate 200 metre ski up. 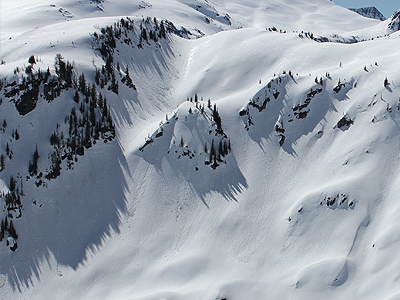 Once you reach the pass Kokanee Glacier Cabin is to the East via the heli-pad. 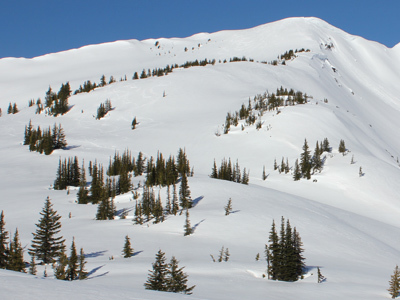 Mount Nansen is located at the headwaters of Griffin Creek to the Southeast of Kokanee Glacier Cabin. It's summit is a beautiful 1.5 hour walk through a large rolling valley with a modest 360 meter gain. From Kokanee Glacier Cabin put your skins on and head West across Kaslo Lake and skin up the low point which is where Griffin Creek empties into Kaslo Lake. It is a relatively steep 160 meter climb and then things flatten out. Follow this valley gently contouring up to the ridge to the North (your right) and head due West. This climb should be gentle as you are only gaining 100 meters over the next kilometre. Once on the ridge you can drop into the lower 3/4 of Northern Exposure by switching to ski mode before the last steep climb to the false summit you see from the ridge or climb to this summit and get an extra 120 metres of skiing. The climb to the summit is steep, expose alpine so be sure that current avi conditions permit this addition to the ski before you attempt to climb higher. 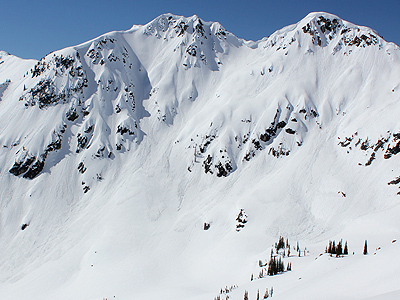 The ski down is 340 metres of steep, open rolly skiing so be cautious. Ski to the valley floor and find a safe place to put your skins on. You can skin back up the way you skied down more or less and do it again however it is steep and exposed in this area. The common route is to ski down through the Enchanted Forest loosing minimal elevation as you go. You will head Southeast and gain Enterprise Pass in order to get back to Kaslo Lake and Kokanee Glacier Cabin from where you started. From Kokanee Glacier Cabin put your skins on and head West across Kaslo Lake and skin up the low point which is where Griffin Creek empties into Kaslo Lake. It is a relatively steep 160 meter climb and then things flatten out. Follow this valley gently contouring up to the ridge to the North (your right) and head due West. This climb should be gentle as you are only gaining 100 meters over the next kilometre. Once on the ridge continue skinning West along the ridge and climb the prominent peak at the end of the ridge. This steep 100 meter climb to the summit has no trees and can be dangerous if conditions are not ideal so ensure you have the skills and your timing is right. Once on the summit ridge continue past the summit and descend around the small cliff band to gain access to Roll Map. The ski down is 200 metres, open and benchy so pick your line from the top and avoid obvious hazards. Ski to the valley floor and find a safe place to put your skins on. You can ski East down the valley 500 meters and then climb back to the ridge to do it again however it is steep and exposed in this area. The common route is to ski down through the Enchanted Forest loosing minimal elevation as you go. You will head Southeast and gain Enterprise Pass in order to get back to Kaslo Lake and Kokanee Glacier Cabin from where you started. Aquavit is the next run to the West of Roll Map so from Kokanee Glacier Cabin head West across Kaslo Lake and skin up the low point which is where Griffin Creek empties into Kaslo Lake. It is a relatively steep 160 meter climb and then things flatten out. Follow this valley gently contouring up to the ridge to the North (your right) and head due West. This climb should be gentle as you are only gaining 100 meters over the next kilometre. Once on the ridge continue skinning West along the ridge and climb the prominent peak at the end of the ridge. This steep 100 meter climb to the summit has no trees and can be dangerous if conditions are not ideal so ensure you have the skills and your timing is right. Once on the summit ridge continue past the summit and descend around the small cliff band and skin up the ridge about half way to the next peak. The ski down is 200 metres, open and benchy so pick your line from the top and avoid obvious hazards. Ski to the valley floor and find a safe place to put your skins on. You can ski East down the valley 500 meters and then climb back to the ridge to do it again however it is steep and exposed in this area. The common route is to ski down through the Enchanted Forest loosing minimal elevation as you go. You will head Southeast and gain Enterprise Pass in order to get back to Kaslo Lake and Kokanee Glacier Cabin from where you started. Lute Fish is the second run to the West of Roll Map so from Kokanee Glacier Cabin head West across Kaslo Lake and skin up the low point which is where Griffin Creek empties into Kaslo Lake. It is a relatively steep 160 meter climb and then things flatten out. Follow this valley gently contouring up to the ridge to the North (your right) and head due West. This climb should be gentle as you are only gaining 100 meters over the next kilometre. Once on the ridge continue skinning West along the ridge and climb the prominent peak at the end of the ridge. This steep 100 meter climb to the summit has no trees and can be dangerous if conditions are not ideal so ensure you have the skills and your timing is right. Once on the summit ridge continue past the summit and descend around the small cliff band and skin up the ridge stopping just before it gets steep and corniced . 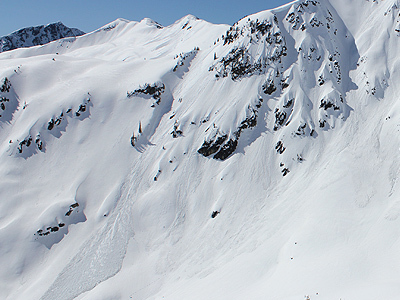 The ski down is 280 metres, open, steep and rolly so pick your line from the top and avoid obvious hazards. Ski to the valley floor and find a safe place to put your skins on. You can ski East down the valley 600 meters and then climb back to the ridge to do it again however it is steep and exposed in this area. The common route is to ski down through the Enchanted Forest loosing minimal elevation as you go. You will head Southeast and gain Enterprise Pass in order to get back to Kaslo Lake and Kokanee Glacier Cabin from where you started. Unibomber is the last route on the same ridge as Aquavit so its access is the same. From Kokanee Glacier Cabin head West across Kaslo Lake and skin up the low point which is where Griffin Creek empties into Kaslo Lake. It's a relatively steep 160 meter climb and then things flatten out. Follow this valley gently contouring up to the ridge to the North (your right) and head due West. This climb should be gentle as you are only gaining 100 meters over the next kilometre. Once on the ridge continue skinning West along the ridge and climb the prominent peak at the end of the ridge. This steep 100 meter climb to the summit has no trees and can be dangerous if conditions are not ideal so ensure you have the skills and your timing is right. Once on the summit ridge continue past the summit and descend around the small cliff band and continue climbing the mellow ridge line. As things steepen stay well back from cornices that tend to form on the North aspect of the ridge. You will once again top out on a peak and then descend slightly to gain access to Unibomber. 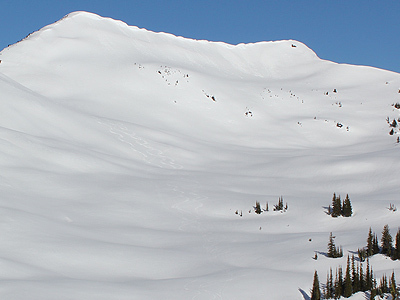 You may find cornices at the entrance to this run so caution is required. The ski down is 300 metres, open, steep and exposed so ensure you have good stability before dropping in. Ski to the valley floor and find a safe place to put your skins on. You can ski East down the valley 700 meters and then climb back to the ridge to do it again however it is steep and exposed in this area. The common route is to ski down through the Enchanted Forest loosing minimal elevation as you go. You will head Southeast and gain Enterprise Pass in order to get back to Kaslo Lake and Kokanee Glacier Cabin from where you started. Mount Nansen is due West of Kokanee glacier Cabin so from Kokanee Glacier Cabin head West across Kaslo Lake and skin up the low point which is where Griffin Creek empties into Kaslo Lake. It is a relatively steep 160 meter climb and then things flatten out. Follow this valley to its Westerly terminus skirting around micro features and heading South following Griffen Creek and then contouring back to the Northwest when the terrain steepens. Here you will see Mount Nansen in the distance with a further 260 metre climb required on steep open slopes so be sure stability and skills of the group are in your favour. Ski down the way you came and repeat or head back to the cabin. Mount Giegerich is located close to Lemon Pass and is accessed via Griffin Creek. It will take you a few hours to get over to this summit but the views of this area are worth the walk as is the skiing. 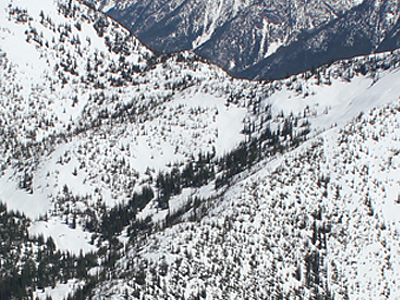 Mount Giegerich summit is 2,249 metres and offers up great views of the West side of Kokanee Glacier Park. 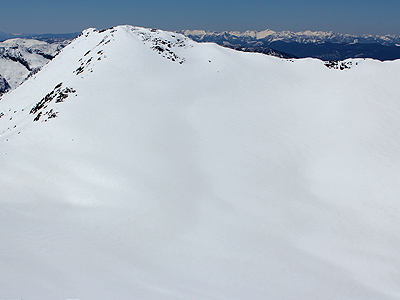 The ascent is gentle as is the ski down but be aware of cornices forming on the ridge. To access Mount Giegerich from Kokanee Glacier Cabin head West across Kaslo Lake and skin up the low point which is where Griffin Creek empties into Kaslo Lake. It is a relatively steep 160 meter climb and then things flatten out. Follow this valley as if to ascend Nansen Mountain but instead head more Southwesterly to the peak directly South on the same ridge line. There is a sparsely tree ridge line that you can follow to the summit staying well away of the steeper Skol route on Giegerich's more northerly side. From the summit Molly's Eleven route is the most direct line back down more-or-less the way you ascended. It's a long, mellow heli-ski type route so enjoy. The way back to the cabin is the exact way you came so simply follow your tracks. 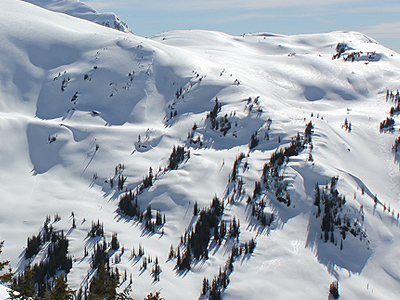 Mount Giegerich summit is 2,249 metres and offers up great views of the West side of Kokanee Glacier Park. 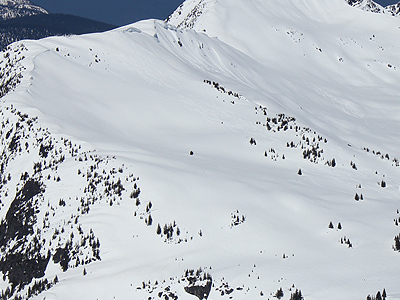 The ascent is gentle as is the ski down but be aware of cornices forming on the ridge. To access Mount Giegerich from Kokanee Glacier Cabin head West across Kaslo Lake and skin up the low point which is where Griffin Creek empties into Kaslo Lake. It is a relatively steep 160 meter climb and then things flatten out. Follow this valley as if to ascend Nansen Mountain but instead head more Southwesterly to the peak directly South on the same ridge line. There is a sparsely tree ridge line that you can follow to the summit staying well away of the steeper Skol route on Giegerich's more northerly side. From the summit Skol is just to the North of the summit and the treed ridge which you likely ascended. Caution is required skiing this route as it is steep and typically Corniced, you will want to ski it one at a time and only in stable conditions. The way back to the Kokanee Glacier Cabin is the exact way you came so simply follow your tracks. 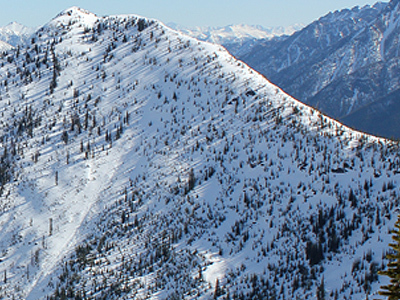 Mount Giegerich summit is 2,249 metres and offers up great views of the West side of Kokanee Glacier Park. The ascent is gentle as is the ski down but be aware of cornices forming on the ridge. To access Mount Giegerich from Kokanee Glacier Cabin head West across Kaslo Lake and skin up the low point which is where Griffin Creek empties into Kaslo Lake. It is a relatively steep 160 meter climb and then things flatten out. Follow this valley as if to ascend Nansen Mountain but instead head more Southwesterly to the peak directly South on the same ridge line. There is a sparsely tree ridge line that you can follow to the summit staying well away of the steeper Skol route on Giegerich's more northerly side. From the summit the East face is the large bowl to the south of the treed ridge line you ascended and just south of Molly's Elevens. There is plenty of room on the East Face to ski it lap after lap, the pitch is not steep but it is sustained. The way back to the Kokanee Glacier Cabin is the exact way you came so simply follow your tracks. Mount John Carter is named for John Carter who worked at Kokanee Glacier Park as a hut custodian and park ranger for many, many years. He also wrote a guide book about the park and died tragically in an avalanche in 1996. Mount John Carter is 2,606 metres high and is connected to Outlook Mountain via a short ridge line. 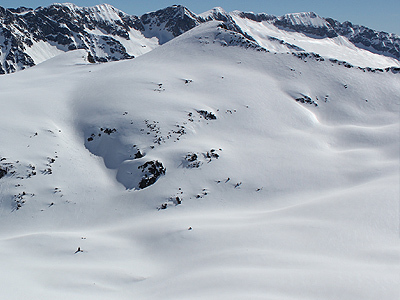 Mount John Carter is in full view from Kokanee Glacier Cabin and offers a variety of routes from it's summit at 2,610 metres, they range from long and flowing to short and steep. The most direct approach from Kokanee Glacier Cabin is by crossing Kaslo Lake to the South and skinning up Outlook Creek drainage until you get to Sapphire Lakes. From here you can pick your way up onto the large bench to the East before things cliff out and you get stuck in Glory Basin which only has steep and exposed routes to the summit. Once on the bench you will get a good view of the summit of Mount John Carter off in the distance to the South. It is a long rolling climb to the summit with the last 100 metres being the steepest. Once at the summit take in the 360° views, switch over and ski on a fall line directly back to Kaslo Lake and the cabin. 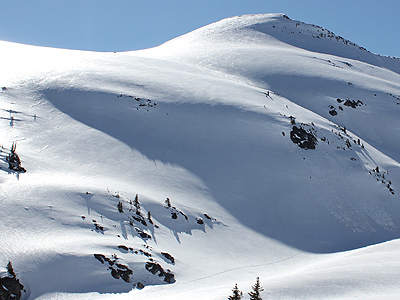 If you are planning on skinning to the summit of Mount John Carter you may want to consider skiing routes Mount John Carter West #1, #2, or #3. Heck, if you are going that far you may want to ski all three and then still go back to Kokanee Glacier Cabin via the traditional Mount John carter route mentioned above. To access Mount John Carter West #1 you can take the approach talked about above in the Mount John carter North route description or if you like to skin up what you will ski down then follow the Route to Sunset Mountain and instead of heading slightly West to climb Sunset Mountain veer East at the end of Glory Basin. Be warned though, this route is steep and exposed so you better know how the snow pack is behaving before setting out for this route. If snow conditions permit and you are able to ski Mount John Carter West #1 then give #2 or #3 a try or just Yo-yo #1 again and again. All three of these routes are the same aspect on the same ridge but offer their own unique ski experience. 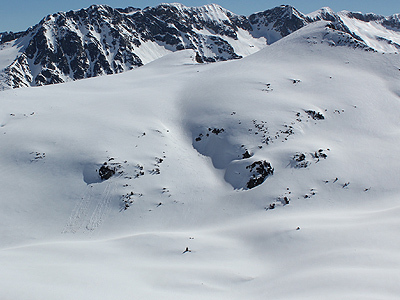 If you are planning on skinning to the summit of Mount John Carter you may want to consider skiing routes Mount John Carter West #1, #2, or #3. 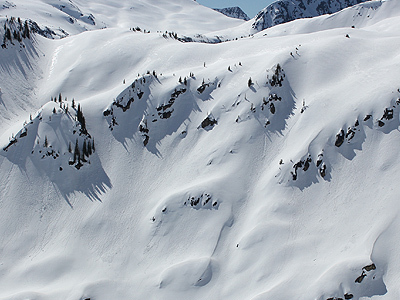 Heck, if you are going that far you may want to ski all three and then still go back to Kokanee Glacier Cabin via the traditional Mount John carter route mentioned above. To access Mount John Carter West #2 you can take the approach talked about above in the Mount John carter North route description or if you like to skin up what you will ski down then follow the Route to Sunset Mountain and instead of heading slightly West to climb Sunset Mountain veer East near the end of Glory Basin. Be warned though, this route is steep and exposed so you better know how the snow pack is behaving before setting out for this route. If snow conditions permit and you are able to ski Mount John Carter West #2 then give #3 or #1 a try or just Yo-yo #2 again and again. All three of these routes are the same aspect on the same ridge but offer their own unique ski experience. 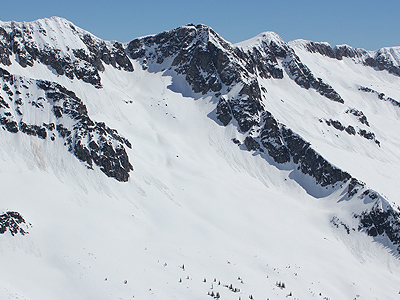 If you are planning on skinning to the summit of Mount John Carter you may want to consider skiing routes Mount John Carter West #1, #2, or #3. 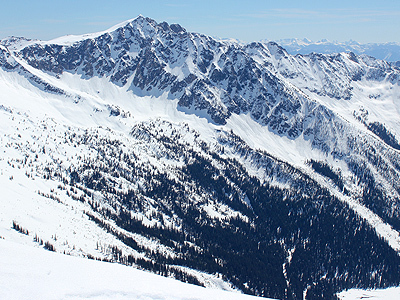 Heck, if you are going that far you may want to ski all three and then still go back to Kokanee Glacier Cabin via the traditional Mount John carter route mentioned above. To access Mount John Carter West #3 you can take the approach talked about above in the Mount John carter North route description or if you like to skin up what you will ski down then follow the Route to Sunset Mountain and instead of heading slightly West to climb Sunset Mountain veer East well before you get to the end of Glory Basin. Be warned though, this route is steep and exposed so you better know how the snow pack is behaving before setting out for this route. If snow conditions permit and you are able to ski Mount John Carter West #3 then you may want to climb farther South along the ridge to give #2 or #1 a try or just Yo-yo #3 again and again. All three of these routes are the same aspect on the same ridge but offer their own unique ski experience. The Giants Nut Sack as its called starts just below the summit of Mount John Carter on the more level bench that you can see from Kokanee Glacier Cabin. It ends at the North end of Kokanee Lake and provides a sustained 480 metre descent with some steeper sections and benches. Follow the instructions above in the Mount John Carter North route but instead of climbing the steep 100 metres to the summit switch over and ski down to the East to the North end of Kokanee Lake. Be sure to over shoot the North end of the lake because you don't want to end up in the middle of this giant terrain trap. It is also much steep as you go south down the ridge and avalanche hazard increases. To return to Kokanee glacier Cabin skin through Kokanee Pass and towards Keen Lake and ultimately Kaslo Lake and the cabin. It is a relatively flat and short 2 km skin back to the cabin so you may have time to try other routes along this East facing ridge if the stability allows. 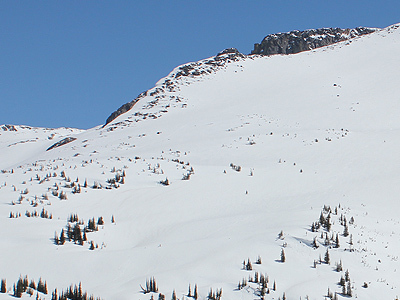 Easy's is on the West face when looking up to Mount John Carter from Kokanee Glacier Cabin. It's a nice sustained line that ends at Kokanee Pass and due to it's 240 descent you can easily ski this line multiple time in the day. From Kokanee glacier Cabin head South across Kalso Lake and then make you way up Keen Creek Drainage avoiding any terrain traps and staying in the relative safety of the trees and not the drainage itself. After climbing to 2,200 metres its time to ski back down. 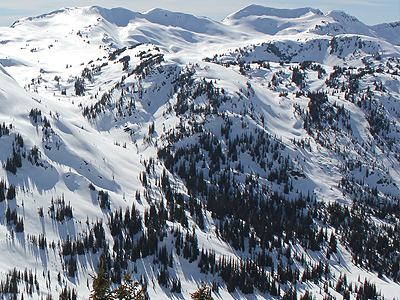 Ski South of the Keen Creek drainage paying close attention to benches and natural hazards. When you get to Kokanee Pass you can either do it again or it's a relatively flat and short 2 km skin back to the cabin. Simple Pleasures route is just to the North of Easy's but still South of Keen Creek Drainage. It's a nice sustained line that ends at Keen Lake and due to it's 160 metre descent and proximity to Kokanee Glacier Cabin, you can easily get in multiple laps. From Kokanee glacier Cabin head South across Kalso Lake and then make you way up Keen Creek Drainage avoiding any terrain traps and staying in the relative safety of the trees and not the drainage itself. After climbing to 2,160 metres its time to ski back down. 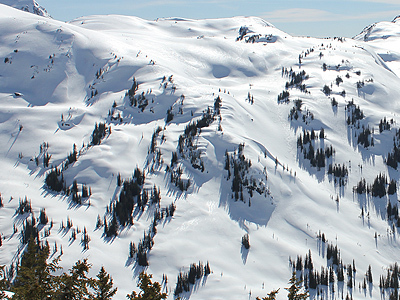 Ski South of the Keen Creek drainage paying close attention to benches and natural hazards. When you get to Keen Creek you can either do it again or it's a relatively flat and short 1.5 km skin back to the cabin. Beaujolais is the most Northerly route in the East facing chain of Giant's Nut Sack, Easy's and Simple Pleasures and offers just over 200 metres of good close to the cabin skiing. From Kokanee glacier Cabin head South across Kalso Lake and then make you way up Keen Creek Drainage avoiding any terrain traps and staying in the relative safety of the trees and not the drainage itself. When the terrain starts to mellow out just over 2,200 metres its time to de-skin and ski down almost the way you came up and with Keen Lake in your sights. it's a relatively flat and short 1 km skin back to the cabin. 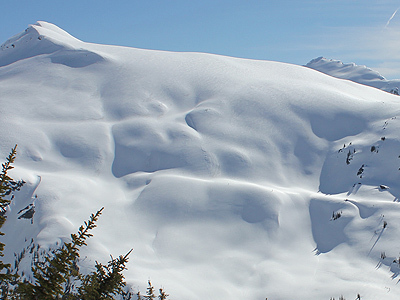 This route is very close to the cabin and lightly treed with many variations to ski. Be sure to lay down good lines as they will be on full display from those at Kokanee Glacier Cabin. Head to the South end of Kaslo Lake from Kokanee Glacier Cabin and start climbing the treed rib between Commission Creek and Outlook Creek. The top is called Riddles Knob and stands at 2160 metres. The ski down is through sparse trees and rolling terrain with a few benches thrown in to keep you alert. After 260 metres you will be back at the shores of Kaslo Lake with the Cabin in sight. Sunset mountain is due south of Sapphire Lakes at the end of Glory Basin and a nice climb with a sustained fall line of over 210 metres. This slope gets cooked by the sun in late winter as it is East facing so best to get there early if you plan to skin to the top. The approach from Kokanee Glacier Cabin is to follow the general direction of the summer trail to Sapphire Lakes. Cross Kaslo Lake and head West up Griffin Creek, then South to Sapphire Lakes. Continue on to Glory Basin and you will see Sunset Mountain at the end of the valley. 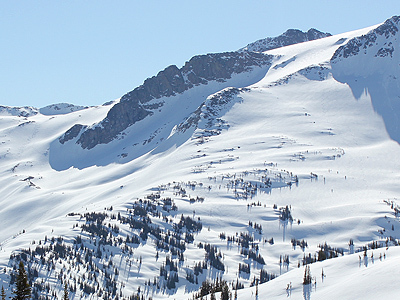 It's a long haul to get to Sunset so while you are there you may want to consider skiing Mount John Carter as well. Andy's Slide is a short but sweet route that dumps into the Commission Creek drainage at the North end of Mount John Carter. It is only 100m but its steep and cliffy. As the name suggests this North facing slope is prone to slides so be sure to pick your days when conditions are stable. There are plenty of variations in this mini bowl feature so poke around and ski a few but be sure to be cautious. From Kokanee Glacier Cabin head Southeast across Kaslo Lake and head to the end of Commission Creek drainage, there you will see Andy's Slide, it's that simple. To head home just go back the way you came. 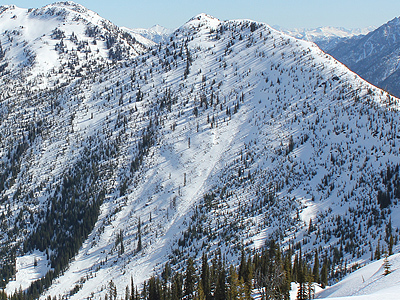 The Pyramid is easily viewable from the decks of Kokanee Glacier Cabin by looking Southwest. It's found a few hundred metres down the North ridge of Mount Kitchener and looks like a pyramid from a distance. 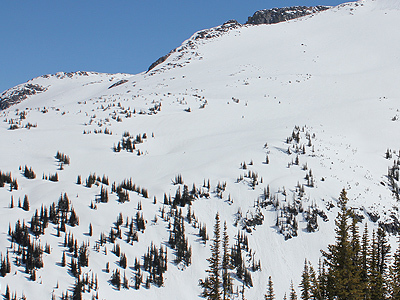 The Nothwest face offers some good skiing very close to the cabin however the upper routes are often wind scoured by prevailing winds coming North from Kokanee Lake Pass. Fields of Dreams is the closest route to Kokanee Glacier Cabin listed in this section. It provides a quick lap with good pitch in open alpine terrain. From Kokanee glacier Cabin follow the summer trail to the Slocan Chief Cabin but once you reach the highpoint, instead of descending down into the Kalmia Lake area stay on the ridge and continue climbing Southeast up Smuggler's Ridge. After a short one kilometer skin you will be at the starting point of Field of Dreams. Ski down amongst the sparse trees avoiding any steeper sections and cliff bands. At the bottom of the valley you should be standing beside Keen Lake and from here it's a short, flat skin back to Kaslo Lake and Kokanee Glacier Cabin. J.C.'s starting point is just South of Field of Dreams so the access is the same. Again you will climb Southeast up Smuggler's Ridge and after a short skin you will be at the starting point of J.C.'s. Ski down amongst the sparse trees avoiding any steeper sections and cliff bands. At the bottom of the valley you will only be a short distance to Keen Lake and from here it's a short, flat skin back to Kaslo Lake and Kokanee Glacier Cabin. Knee D-2 is a route that starts just below the Pyramid and leads directly into J.C's to provide a much longer ski descent than the previous two routes mentioned. 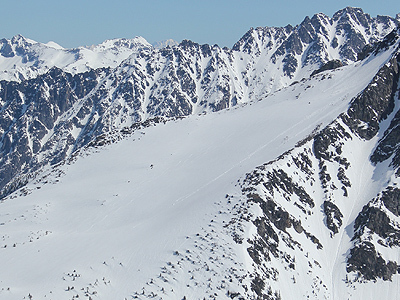 To access Knee D-2 again climb Southeast up Smuggler's Ridge, this time skin higher up to 2,400 metres just below The Pyramid. Caution is required as the terrain is open and gradually gets steeper as you skin higher. Ski down with caution eventually reaching the start of J.C.'s and continue skiing amongst the sparse trees avoiding any steeper sections and cliff bands. At the bottom of the valley you will only be a short distance to Keen Lake and from here it's a short, flat skin back to Kaslo Lake and Kokanee Glacier Cabin. Knee Dropping Tree Fairy is a much longer run as it starts just above and to the South of The Pyramid with a descent of 540 metres when you include Field of Dreams which this route leads right into. 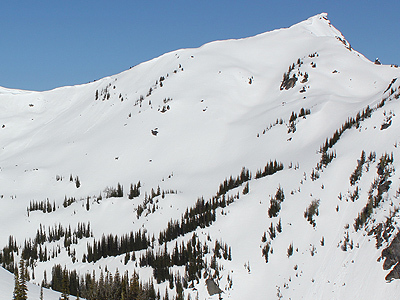 The access from Kokanee Glacier Cabin is again via Smuggler's Ridge, this time skin higher up to 2,500 metres. Caution is required as the terrain is open, typically wind swept and gradually gets steeper as you skin higher. Ski down with caution eventually reaching Field of Dreams and continue skiing amongst the sparse trees avoiding any steeper sections and cliff bands. At the bottom of the valley you will only be standing next to Keen Lake and from here it's a short, flat skin back to Kaslo Lake and Kokanee Glacier Cabin. Squat to pee is a short but steep route which is located on the ridge between The Pyramid and Mt. Kitchener. It only provides 140 metres of skiing but from its terminus you can then ski Knee Dropping Tree Fairy and then Filed of Dreams for the full 660m metre descent. The upper reaches of the Pyramid are steep and typically wind scoured so caution and good avi senses are required. At the bottom of the valley you will only be close to Keen Lake depending upon if you skied Field of Dreams or J.C.'s. From here it's a short, flat skin back to Kaslo Lake and Kokanee Glacier Cabin. 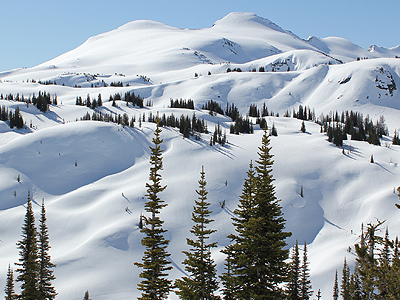 If your energy levels are high, daylight hours long and you are interested in exploring Kokanee Glacier Park then the following two ski tours are ones not to be missed. Both routes take you up the famed Kokanee Glacier (where the park gets its name sake from) and between the Battleship and Mt. Kitchener. From a height of 2,700 metres you get the best views in the park in all directions including East into Coffee Pass, the Sawtooth Ridge and Mount Kane. The Key Hole is one of the most popular hikes in the park in summer months and arguably one of the best ski tours when avi conditions permit. It's named the Keyhole due to the slender shape of access from the ridge. This steep and narrow entrance is a short lived couloir since it opens up into an expansive Westerly face that provides room for even the largest of backcountry skiing groups. To access the Keyhole leave Kokanee glacier Cabin and follow the summer trail to the Silver Spray Cabin (now a museum). If you are unfamiliar with this route head East towards Kaimia Lake and either contour high up the slope to gain elevation and reach the terminal moraine of Kokanee Glacier or take it slow and stead and ultimately reach the same location. Keeping the Pyramid on your right and the Kokasaurusp to your left climb the glacier until you reach the top of what is known as the Battleship staying closer to it than The Pyramid as most of the crevasses open up on the West side of the glacier. An alternate route if conditions are not favourable for the previous approach is to Ski tour around to the East side of the Kokasaurus again gaining the height of land and The Battleship at 2650 metres. From here you will use the Mount Kitchener South ridge as a hand rail and skin a further one kilometre until the entrance of the Keyhole becomes evident just after the odd looking repeater tower and before Esmeralda Peak. Ensure conditions permit a descent of The Keyhole then ski down one at a time through the upper reaches to where things open wide-up. As you ski down traverse North towards the South end of Kokanee Lake and after 700 metres it will be time to switch over and evaluate if crossing Kokanee Lake is safe to cross. If you choose to return to Kokanee Glacier Cabin via the hazardous lake crossing then be sure to move fast and stay in the middle of the lake as avalanche hazard is high from both sides of the valley. This is the location of where Michel Trudeau (son of Prime Minister Pierre Elliott Trudeau) was killed in an avalanche in 1998 so take caution. The trek back to the cabin is still approximately 4 kilometres away but goes quickly since you are on relatively level ground. Gray's Peak is the ultimate big objective from Kokanee Glacier Cabin as takes a full day and lots of energy to complete as this is one of the highest peaks in the park. 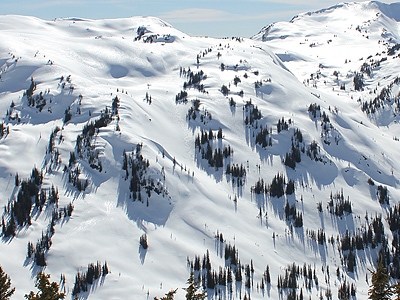 You will traverse Kokanee Glacier from its North end to to its South and get views of near-by Nelson from the 2,753 metre summit. You will cover approximately 22 kilometres round trip and reach the Southern boundary of the park crossing significant glaciated terrain so prepare accordingly and ensure you have enough skill, good weather and solid conditions. To reach the summit of Gray's Peak follow the directions to The Keyhole found above but continue on past Cond Peak (2,801) metres) and Kokanee Peak (2,790 metres). Once past Kokanee Peak you will get your first glimpse of Gray's Peak in the distance to the far South. After a brief descent of a few hundred metres you will end up at the saddle of Kokanee Peak and Gray's Peak, mark this spot as this is where you will descend heading West once you summit Gray's Peak itself. From here continue climbing another 220 metre to gain the summit of Gray's Peak. The last 15 metres is very steep and slightly exposed so you may want to boot pack this portions if conditions permit. The route down is by skiing back to the saddle we spoke of earlier. Ski down the West face contouring North as you go. 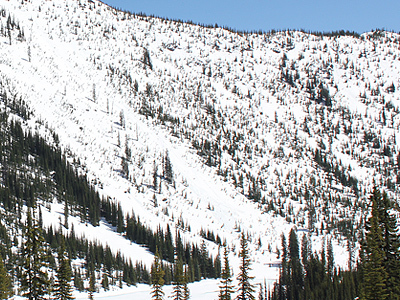 Be careful not to ski lower than 2,000 meter elevation as you need to gain Kokanee Lake at this elevation. The terrain is very benchy and rolling so the ski tour back home is not as straight forward as you may think. This Tour will take a full day so leave early and be very well prepared.